Nine months after the events of the season 2 finale, we see a woman named Pandora meet the Headless Horseman in the woods and sings a song to seal him and his horse into a box. In return, she is granted the power of a demon that can kill its victims by inducing extreme fear in them. Abbie is an FBI agent now and a highly successful one at that. But she's called back by Ichabod who needs her help after he was arrested for smuggling a tablet from his travels into the country. Abbie arranges to have him released and he shows her Katrina's tablet which is linked to Abraham's soul. The energy has been drained completely from it so this means that the second tribulation will now begin. Abbie is driving Crane away from the prison and though he is determined that the tablet is part of their mission, she is insistent that their mission is over. But they then get a call about two dead bodies (which were earlier killed by Pandora's fear demon). 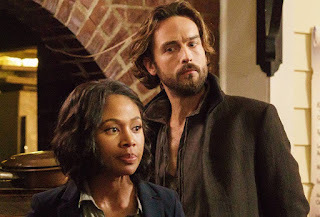 But Crane quickly determines that a demon was responsible for the deaths and informs Abbie that evil has returned to Sleepy Hollow. Forensics reveal that the victims were literally paralysed with fear before they were killed. Ichabod and Abbie are reunited with Jenny, who shares how she helped Irving disappear in order to protect his family. Their old hideout is in a building set to be demolished but the trio decides to band together to try to track down the murderous demon. Ichabod shares about the relationship he had with Betsy Ross (which was both professional and personal) and it leads them to a message she had once carried which will help them kill the demon. Ichabod decodes it and learns that the demon is vulnerable to injury when its eyes are whitened and has an attraction to gunpowder. Ichabod and Jenny are able to lure the demon using gun powder while Abbie is on a raid but things go wrong, forcing Abbie to shoot the demon dead as it is attacking Ichabod. The demon turns to dust and the Witnesses share a hug. Abbie helps Ichabod get his tablet back and she finds that the tablet has a secret double message in it, with a carving that bears much resemblance to her and Ichabod. It refers to them as "Destroyers." While in the bar toasting their success, Abbie steps away from Ichabod momentarily and runs into Pandora, who has just arrived in town and appears to cops out her enemies.